I was trying to open my eyes at wee hours of the beautiful Friday morning. I was at bliss!! The sunbeams through window were brightening up the room. The moment, wow, it was so pure, sigh!! I happily slid outside my warm blanket, put on the slippers and in next few seconds I was out at the terrace. Experiencing the divine feeling of something, which we, rather ignorantly, say – Good Morning. Not just as always, but slightly extra overloaded, pathetic, tiring day at work. The overlap UK and US hours or our Indian evening hours , which make me terribly think of myself as some local call center employee (with no intention to offend) rather than a busy IT professional. I am sick and tired, longing for a peaceful goodnight’s sleep. 3 conference calls, 2 follow up calls, 1 team meeting , 3 project deliverables, 180 ingoing and outgoing e-mails , 7-8 chat windows , 6 personal calls , 5 cups coffee , no breakfast , lunch of a sparrow , one last crispy piece of spring role , few custom action failures , excel sheets with annoying macros (project reports, they say) , phone battery dying and crying for help (m gone deaf 😦), meeting invite for previous date (that was embarrassing), arrangements to rescue Holi celebrations, never going migraine and on and on …..This you call a day, which ends when you realize you are the last one on the floor. Leave; call it a day, now!!! Back home, hit the bed and I am dead. Needless to say, it was early A.M timings. Leisure of a blissful, beautiful morning! I live on the top floor of this building with a terrace facing state highway and a park. Saw senior neighbors practicing yoga and chunk of ladies taking rounds of their morning walks, a kid washing the cars , some punctual professionals ready in their formal attire carrying their bags waiting at the bus stop, and a tree with long leaves of the shades of yellow and orange, scattered everywhere on the road, pavement, on the roof of cars and park. Strangely, I fell in love with this autumn feeling at this time of spring. Back to my room, my bed, ohh , I am back to my laziness , zzzzzzz sleeping. The one I desired for. This time dawn seems to be a struggle, I woke up at P.M timings. Wondering why the alarm fails to bring me back from dead. Still in process of waking up , I made efforts to find my soul mate , that was supposed to be next to me , near my pillow. (Let me remind all, I call my mobile phone as my soul mate). He was almost dead. Oh, poor baby, more than me, he needed a life. I am a good host. I rushed to my desk, got the equipment, and put the soul mate to his ventilator. Wishing him speedy recovery, I made myself a big cup of green tea and start making my today’s To-Do list. (I am old-fashioned , paranoid, have this habit). Voila 🙂 🙂 🙂 , nothing, just one Toastmaster’s Meeting. Hurray !! 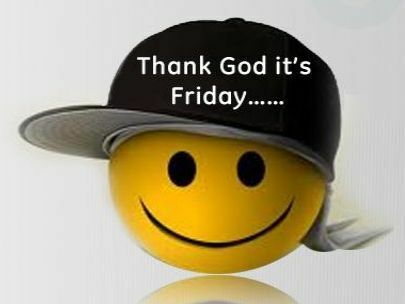 Thank God it's Friday ; Image source - My work desktop screen shot. No deliverables, No Client Calls, No deadlines, ignoring the fact its 2nd of the month , no bills to pay , no , nothing. Till now , it’s really been a Friday. I am enjoying , a bit sleepy , a bit tired but chirpy , bubbly playing with outlook , e-mails pouring in , e-mails shooting out. What more can I ask for, week long vacation approved , with few kind words of appreciation. Yeah !! Fingers Crossed, I still have to travel back home , some 5 hrs road journey in a state roadways bus. I wish the rest of the day remains the same.